Liverpool's local TV station has announced plans to relaunch tomorrow with a new line-up of programming. Made TV, the largest local TV operator, acquired 100% of Bay TV Liverpool when it went into administration in August. At the time it said that all 17 staff would be staying on, and the reincarnated channel, Made in Liverpool, will go live at 6pm tomorrow after two weeks off-air. 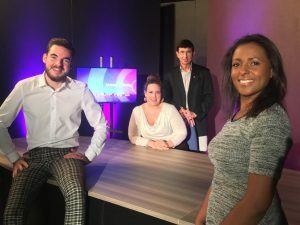 The inaugural show will be a live news programme called Liverpool Today, presented by Peter Berry, Emily Bonner, Nathan Griffiths and Charlene Smith. It will be followed by a nightly three-hour magazine show, The Lowdown Liverpool, featuring Ben Osu, Charlene Smith and Gaelle Legrand. Made says that locally produced content will be "blended" with shared programmes produced across the Made Television network - it already has stations in Bristol, Cardiff, Leeds and Tyne & Wear - as well as acquired shows such as Sarah Beeny's Double Your House for Half Your Money and Dawn O'Porter's This Old Thing. Other original, local programmes will include weekly football show Across the Park, music show The Liverpool Sound and local history format Streets of Liverpool. Jamie Conway, CEO of Made Television, said: "We've a fantastic schedule of new programming lined up and we're really looking forward to launching on Wednesday and to capturing the fun, energy and action of the Liverpool region."